More leftover-based lunches this week! Maybe I'll actually get my refrigerator cleaned out at this rate! We oven-baked honey BBQ chicken wings this week and ended up with 6 leftover. 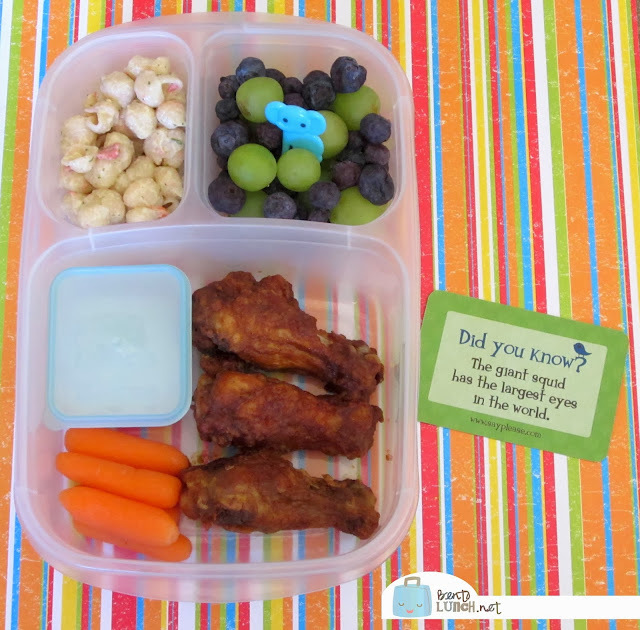 Two kids, six wings, two lunches! Ben took three of the chicken wings, along with a small container of ranch dressing to dip them in. He also has carrots (likely with the ranch too), a bit of pasta salad, and a mixture of grapes and blueberries. Lunch is packed in our Easy Lunchboxes, with ranch dressing in an ELB Mini-Dipper. We also added a Lunchbox Love card, both kids love these. Those wings look so gd!